Even before his campaign for reelection began running an ad that Factcheck declared as Rep. Grayson lowers the bar, the progressive congressman from Florida’s 8th congressional district was an embarrassment to his district, state and the legislature in which he sits. To put it succinctly, every time the word crazy is used in Washington DC, Alan Grayson considers it a call to action. His venom has been directed toward just about everyone, whether they be Republicans (they want you to die quickly) a former Vice President (a Vampire) or a consultant in the treasury department (k street whore), even press secretary Robert Gibbs (Bozo the Spokesman). He has kept up this scorched-earth approach in his re-election campaign, branding Mr. Webster “Taliban Dan” and “a draft dodger” in a couple of ads. Independent fact-checking organizations have judged those ads as false. So have we. Mr. Grayson’s antics are not merely an embarrassment to himself and his district. They deepen the partisan divide that has left Congress almost dysfunctional. It’s too bad. Mr. Grayson has a steel-trap mind, and a successful background in business that might otherwise command the respect of Republicans. 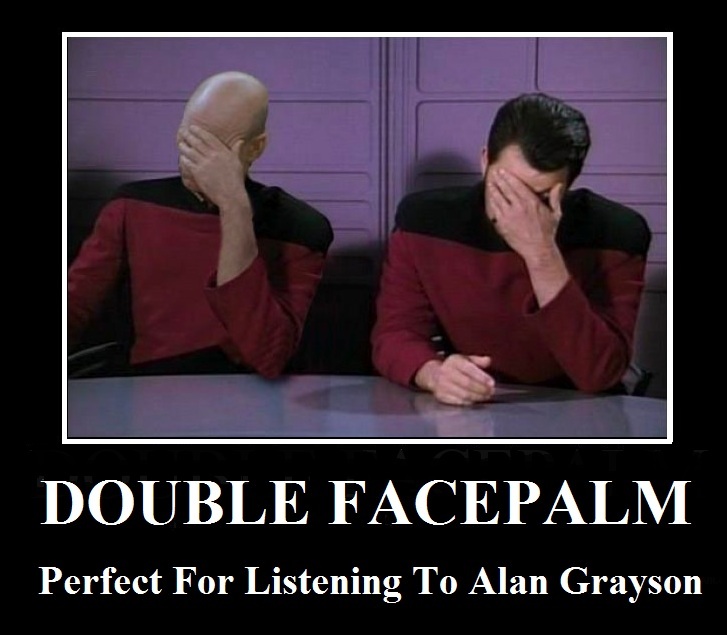 ….And Mr. Grayson has wildly exaggerated his role in the other accomplishments he’s claiming in this campaign. For example, he is taking personal credit for “saving schools” because he supported last year’s economic stimulus package and its additional billions for education. So did virtually every other Democrat in Congress. Along with his nastiness, Grayson has helped the Nation achieve its record deficits. In a time of record red ink in Washington, Mr. Grayson still has a devil-may-care attitude about federal spending, unless it is for the wars in Iraq and Afghanistan. He has called President Obama’s bipartisan panel on reducing the deficit the “Catfood Commission.” He argues huge budget shortfalls aren’t bad if inflation and long-term interest rates stay low. Meanwhile, those deficits are pushing the United States deeper into hock to China and other foreign creditors. Interest payments on the national debt, already $200 billion a year, have been projected to reach $700 billion in another decade at the current rate of spending. That’s a lot of money that won’t be available to meet the “human needs” that Mr. Grayson cites when justifying his insatiable appetite for more federal spending. The Sentinel praises Webster as a much needed change for the district someone with a superior record in the State Legislature and a person who can work well with both sides of the political aisle. In sharp contrast to Mr. Grayson, Mr. Webster was a Republican state legislator for nearly three decades whose civility and statesmanship earned him the admiration of Democrats. He wasn’t just a nice guy; he was effective. He played a leading role in raising education standards, reforming welfare and opening lawmaking to more public scrutiny. During his term as House speaker, Republicans and Democrats agreed to a statewide expansion of Healthy Families, a successful program to prevent child abuse and neglect. Like other Republicans running this year, Mr. Webster has pledged to bring federal spending under control. His call, however, to roll back spending to 2007 levels is unrealistic, as is his vow to cut taxes. We take more comfort from his experience in balancing state budgets year after year. Mr. Grayson has attacked Mr. Webster for his arch-conservative positions on abortion and other social issues. We don’t care much for those positions, either. We urge him, if elected, to focus instead on bipartisan solutions to the nation’s biggest problems, starting with reviving the economy. His experience in Tallahassee gives us good reason to think he can. The Orlando Sentinel’s endorsement was well put. And if that doesn’t convince you, take a look at Alan Grayson’s best TV appearance as he was decimated by Neil Cavuto.